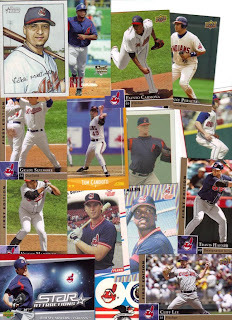 Indians Baseball Cards: Indians from the Great White North, eh! A couple weeks ago, I received an email from Charles, letting me know that he had picked up some 2009 Upper Deck cards and would like to trade some Tribers! Excellent! In return, he wants Blue Jays, which works out pretty well since I've got more than a few headed his way. Two cards didn't make the scan: 2009 UD Series 1 Victor Martinez and a 2006 UD Eduardo Perez. Man, these are great and are very much appreciated!! Thanks to Charles from the land up above for some very cool Indians to add to my collection!! In exchange, he'll get some Blue Jays to (hopefully) add to his.